Travelers and Honeymooners from the Gulf are heading to the throbbing heart of Dubai to beat the summer heat by cooling off at the first "ice lounge" in the Middle East. The Dubai's Chillout cafe interior decor is made entirely of carved ice, with frozen picture frames, ice curtains and frosty seats covered in fur. The interior of the cafe, owned by UAE’s Sharaf Group. The cafe is lit with multi-colored fluorescent lights. Visitors are kitted out with thermal jackets; boots and fur hats provided by the cafe in a striking similarity to the ice hotels which dot Scandinavia in winter. also out in front of the rest of the world when it comes to man-made islands, from the frond-shaped Palm Jumeirah to The World, an archipelago currently under construction that will form a world map when viewed from above. Such architectural excesses have helped make the emirate a go-to destination for well-heeled tourists. The hotel's Lost Chambers suites provide views from both the bedroom and the bathroom windows into a lagoon filled with marine animals. The Water Discus Hotel is Dubai’s latest attempt to wow seeking travelers. Billed as the world’s largest underwater hotel, at this point the resort, which is being developed by Polish developer Deep Ocean Technology. The plans call for 21 suites spread across two main discs – one above water and another immersed about 38 feet under the waves. 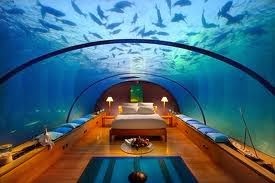 Special lighting technology will allow guests in underwater suites to observe the flora and fauna outside their windows. There is no official opening date for the hotel as yet, it seems likely that the underwater accommodations will be popular. Take an opportunity to visit the Tallest building in the world, the 124th floor of the building pictured above and look out. If you’re going to be in Dubai even for just a few days, a trip up the Burj Khalifa is recommended. This 828-meter tower, the tallest building in the world by a long shot, has put Dubai on the map even more than it was already. Visitors to At the Top, the world's highest observatory deck with an outdoor terrace, will get the chance to win special hampers in hourly quizzes that test their knowledge of the Burj Khalifa. For the first time, visitors will be able to watch the sunrise from the tower – it will open early on weekends until February 28. One-of-its-Kind Dinosaur-Themed Facility in Region. Over 4,700 Sq. Ft. Recreational Arcade Features Laser Tag Arena , on 11 March, 2013 – Oasis Centre has announced the addition of Thrill Zone, a unique laser tag and recreation concept, to its entertainment portfolio. Spanning over 4,700 sq. ft. The laser tag arena is complemented by 6D cinema, party area and the in-house café that serves one of the world’s best coffees from Italy and delicious snacks. 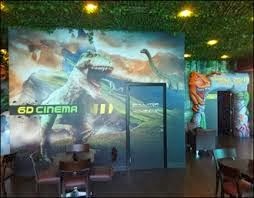 Sporting a dinosaur theme, the innovative facility promises to deliver quality entertainment for kids and adults alike. Some of its star attractions include a laser tag arena and a first-in-the-UAE 6-D cinema experience. An in-house café serves sumptuous snacking options at the outlet that also includes an expansive party hall for hosting kids' parties, college outings and team building events. Let the adventure begin.